The pregnancy ends in labor or the birth of a child. There are certain problems that may develop during the pregnancy. However there are additional ones that may happen during the very labor. Women are not supposed to worry as the pregnancy usually ends with no or very minor complications. Still all the women have to be warned of possible risks. The main duty of a doctor is to recognize complications on time and react promptly. The labor goes through three stages. Complications may occur in any of these stages. All the complications of labor can be classified into delays in labor, fetal distress and bleeding complications. In the first stage of the delivery there are several reasons for delay in labor. These includes insufficient uterus contractions, inappropriate position of a baby and certain structural abnormalities of mothers pelvis. Inappropriate contractions are not efficient enough to accelerate dilatation of cervix. The uterus is not strong enough and the labor cannot continue into the stage two. In case that amniotic sac ruptures the uterus may be additionally urged to contract properly. In case that even this cannot help a woman is administered special medication that will include and accelerate the labor. Complicated labors and those that last for too long and may endanger both the mother and a baby. This is why in most cases a Caesarian section is performed. This procedure is also conducted in cases that baby's head is too large and if baby is in abnormal position. Fetal distress is a serious condition that features with insufficient levels of oxygen in baby's blood. Each contraction of the uterus discontinues the placental supply with oxygen. Left without oxygen the baby may experience series of consequences. The signs of fetal distress are the presence of meconium (the first baby's stool) in amniotic fluid disturbances in baby's heart rate and excessive movements of the baby while in the uterus. 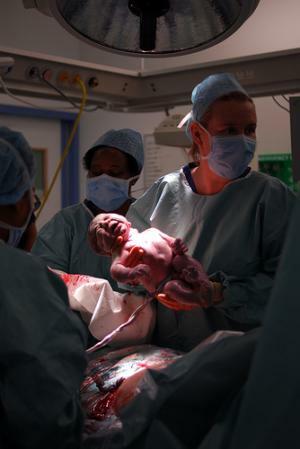 Once again Caesarean section is performed to help the delivery. Hemorrhage after the delivery is stopped due to proper contractions of the uterus. A woman may be administered Syntocinone as this medication can stop bleeding. If episiotomy has been performed the bleeding wound has to be surgically repaired. In some cases the spot of the bleeding is ruptured cervix. The rupture may happen during fast and quick deliveries. This complication also has to be surgically treated. Stitching of both, episiotomy and ruptured cervix is done under local anesthesia.